FPGAs are large-scale, runtime programmable logic devices which generally include hundreds of customizable I/O pins. The Xilinx Spartan-6 is a family of low cost, low power consumption, logic-optimized FPGAs that provide fast and comprehensive connectivity. They offer an efficient, dual-register 6-input lookup table (LUT) logic and a rich selection of built-in system-level blocks. Critical Link’s MityDSP family of System on Modules (SOMs) combine a Xilinx FPGA along with a DSP and/or ARM processor. 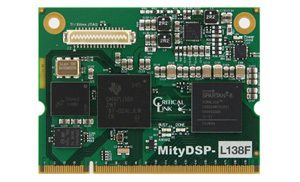 The MityDSP family includes a number of boards utilizing TI’s OMAP-L, C6000, and Sitara processors. These SOMs – the MityDSP-L138F and the MitySOM-1808F – are designed for applications with requirements for low-power usage and rapid time to market. 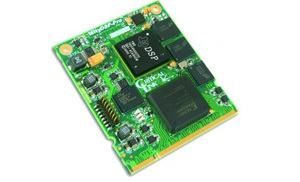 Each of these boards offer an optional Xilinx Spartan-6 FPGA, the XC6SLX16, for expanded I/O, co-processing, and signal processing, or to support high speed data acquisition.